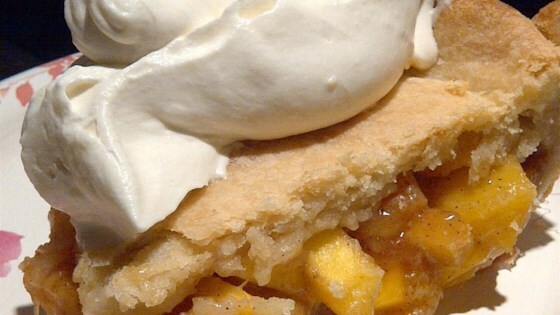 "If you like peach pie, you will love this dreamy tropical pie. It has a brighter flavor with the added beauty of this luscious island fruit. This recipe came about after I was gifted with a large bag of mangoes by an anonymous Maui neighbor. I was determined to use every single one of them and by adapting an apple pie recipe, I came up with this delicious pie. Another bonus.....the sweetness of the mangoes reduces the need for added sugar." Preheat oven to 400 degrees F (200 degrees C). Line a 9-inch pie pan with half of the pie pastry. Set aside. Combine mango, sugar, cornstarch, lemon juice, and cinnamon in a bowl; stir until the sugar has dissolved. Transfer mango mixture into the prepared pie pan. Dot the mixture with the butter, then cover with the top crust. Pinch the edges of the top and bottom crusts together to seal. Cut several vents on the top crust. Bake in the preheated oven until the crust is golden brown and the juices are bubbling, about 45 minutes. You need to use ripe mangoes, but NOT overly ripe mangoes. If your oven runs hot, you may need to partially cover the pie edges so they do not burn or brown too much. Just made this pie tonight, and it was delicious! Husband wants leftovers for work. Great recipe! A nice pie! Not as sweet as I thought it might be - tasted like a cross between an apple and peach pie. Great!